Another view of the River Derwent and the Promenade taken long before the road was widened. It probably dates from the 1920s. 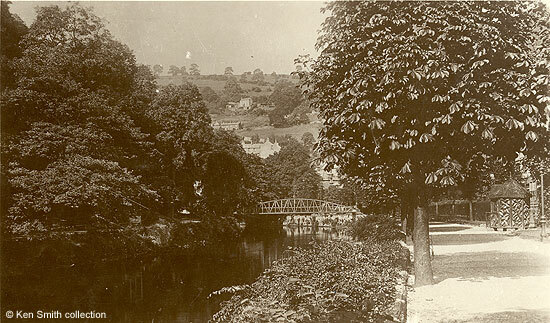 A contemporary description reads: "The greensward of flowers of the Promenade, together with the leafy shades of the Lovers' Walks, forms one of the most popular attractions of the Matlock Bath region". Of interest is the thatched wooden kiosk on the right next to the boundary hedge - one of the four on the "prom". These acted as ticket offices / money collection points during the tourist season. 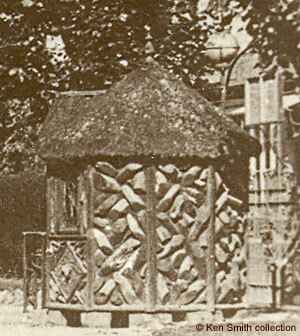 There is an enlargement below and part of the ornate Edwardian turnstile is just about visible behind the kiosk. Although it isn't easy to see, the band stand can be seen amongst the trees on the far side of the river. When the road was widened in the late 1960s the wooden kiosks disappeared, although it was rumoured that at least one of them was to be restored. In the collection of and provided by and © Ken Smith.